Injured by a Tractor Trailer in West Virginia? Call Now! Residents throughout West Virginia know who to call when dealing with the overwhelming aftermath of these serious accidents. Angotti & Straface has earned our reputation as the people’s law firm by providing prompt response times, straightforward case analysis, and prompt, aggressive representation to ensure that each client has the optimal opportunity to recover expenses, damages, and losses for foregone expenses, as well as financial compensation to cover continuing medical treatments, lost wages, and expenses into the future. We know what your case is worth. We have extensive knowledge of all of the rules and regulations that trucks crossing state lines must follow according to the Federal Motor Carrier Safety Administration and are aware that if these regulations were followed, many accidents simply would not occur. We will not accept less that the full, maximum financial compensation that you are entitled to receive. You will not pay any attorney fees unless we recover financial compensation for you. Injured as a Result of a Wreck With a Tractor Trailer or Large Truck? If you have been seriously injured, or you have lost a loved one as a result of a wreck caused by a semi-trailer or large truck in West Virginia, contact Angotti & Straface. We personally work with each of our clients to answer your questions and provide the legal counsel and support necessary for you to make it through this agonizing time. If you have been involved in an accident involving a large truck, you need the best legal team with the resources to fight the nation’s largest trucking companies. Our investigative accident re-constructionists, mechanical engineers, and medical professionals are able to determine how the accident occurred, who was at-fault, and how the collision has and will continue to impact your life into the future, as well as provide an accurate estimate of the true cost impact of the accident on you and your family. 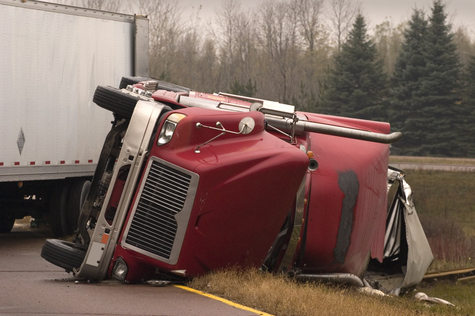 We offer a free consultation to discuss your truck collision injury claim. Contact us at: (304) 292-4381. If you have been seriously injured and are living in Wheeling, Morgantown, Huntington, Charleston, Parkersburg, or elsewhere in West Virginia, and your condition prohibits you from traveling, we will come directly to you in your hospital bed or home.